Where is the version without the answers? The downloaded version has the blank version and the one with the answers, when you view it online, it appears they both have the answers, I don’t know why, but I just downloaded the file and opened it with Acrobat Reader to verify that this is the case. I would have loved this as a substitute teacher resource…too bad the puzzle isn’t available, just the answer key. The PDF attached has 2 pages, the puzzle AND the answer key. 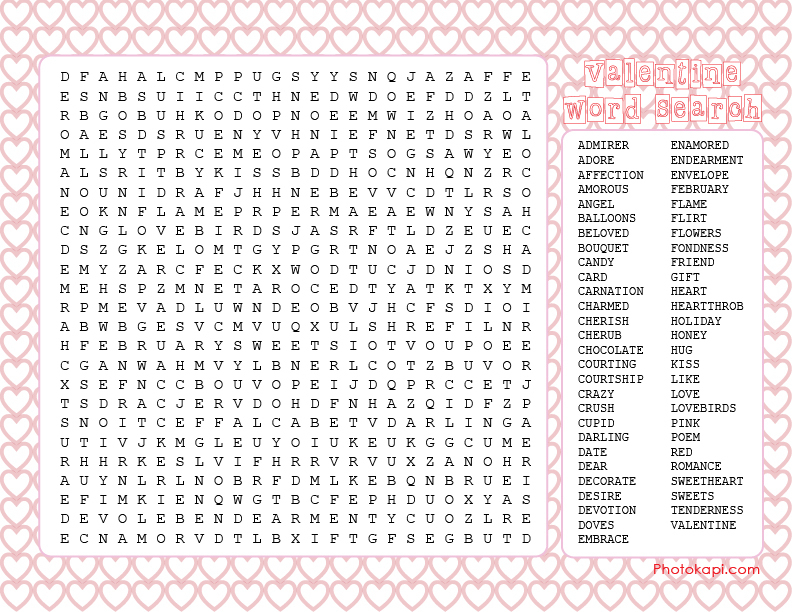 It was there just go to the last link it says download the valentines word search pdf click it next click : that and it will say print. when I downloaded the file and printed it both pages were the answer key. As noted above, you MUST use Adobe Acrobat to view/print them, printing them from the browser prints two answer keys. As noted above by others, we have followed the instructions but only the answer key prints. The original puzzle does not print with the pdf download. I have separated the two PDF files. They are now separate downloads. where are are the answers to make sure my kids got the right? Please re-read the description, both pieces are included. I don’t see the answer key? ?